HP Pavilion dv8000t is a desktop replacement laptop powered by Intel Core Duo T2500 processor. 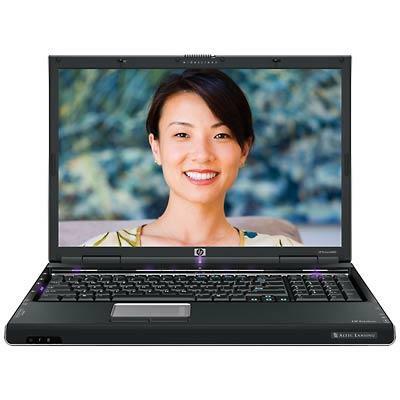 dv8000t notebook features 17-inch WXGA+ display, DVD Super Multi drive, nVidia GeForce Go 7400 graphics card with 128MB of VRAM, 802.11 a/b/g Wireless LAN, Gigabit Ethernet, and integrated 56K modem, Bluetooth connectivity. Other features include four USB 2.0 ports, Firewire, S-Video, headphone and microphone jack, line-out and S/PDIF out interface, Type I/II PC Card slot, and 6-in-1 memory card reader. The notebook computer measures 15.6 x 11.2 x 1.6/1.9-inches and weighs 9 pounds. Short-Media gives dv8000t score of 89% and concludes that with the high performance provided by Intel’s new Duo architecture and the Nvidia 7400 series graphics system, even intensive programs like Photoshop and 3Ds max scream on this bad boy. High level gaming is also well within the scope of this impressive laptop. The only thing I dock a point for is the lack of options in the graphics department. The 7400 and 7600 are great cards, but slamming a 7800 or 7900 Go series in the laptop could mark it as a much more solid mobile gaming unit. Laptop Magazine (dead link) picks HP dv800t as editors’ choice with rating of 4 stars out of possible 5, and concludes that this is a top-notch system with impressive performance, and the $1,698 price tag is competitive given the cutting-edge hardware. Overall, the HP Pavilion dv8000t is an excellent choice.